In the 50’s the arrival of American Rock n Roll had a huge impact on the youth of Britain. Ronald Wycherley was born in Liverpool on April 17th 1941 and he was one of those teenagers that loved the American rock n rollers! Records by Elvis Presley, Buddy Holly, Eddie Cochran and Gene Vincent stirred the blood of the young teenage Wycherley as their records raced up the British charts week after week! When it came to British rock n roll there wasn’t much out there and the British imitators were sometimes on the feeble side, but Marty Wilde, Cliff Richard and Johnny Kidd & the Pirates did try and give it a good go! A lot has been written about how Billy Fury was discovered which was a good bit of PR orchestrated by his manager Larry Parnes, the Brian Epstein of the 1950’s who had an eye for quasi ~ talented, good~looking boys and Billy Fury became the jewel in his pop crown. Billy was the boy pop star with the smoldering good looks and little boy lost look, slicked back hair cut, a cross between Elvis and Eddie Cochran. What teenage girl could resist him with his heavy~lidded vaseline eyes, singing the atmospheric ‘ Wondrous Place ‘. The girls went mad! Billy’s first three top twenty hits were all written by him which is a remarkable achievement at a time when every singer did cover versions of the big USA hits,long before Lennon & McCartney era came along and made it commonplace for artists to record their own songs! Billy Fury released the wonderfully authentic sounding 10″ album ” The Sound of Fury. ” A true British rock n roll statement, featuring tracks like ‘ That’s Love ‘ and ‘ Turn My Back On You ‘ which features the storming rockabilly twanulations of that cheeky cockney chappie Joe Brown on guitar. What might have been if Billy Fury had stuck to his rock n roll path. By the early 60’s in a Presley attempt to make him appeal to a wider audience, his management and Decca record company transformed him with huge success into a clean~cut ballad singer. Billy is best remembered for the song ‘ Halfway To Paradise ‘ with reached No. 4 in the UK chart and was quickly followed by the big melodramatic ‘ Jealousy ‘ and ‘ I’d Never Find Another You ‘. Whatever chance of continuing to write his own rock n roll songs has disappeared and fans of Billy’s brand of rock n roll were left to wonder ~ What if ~ as he was now on the conveyor belt of producing hit records ending up with 26 Top 50 hit singles in the 60’s which is pretty impressive. At the peak of his career whirlwind tours, radio and TV appearances and his films like ‘ Play It Cool ‘ and ‘ I’ve Gotta Horse ‘ kept him busy and a couple of his many backing bands were the Beatles who Billy thought would be trouble and the Tornadoes who went on to have an enormous worldwide hit with ‘ Telstar ‘ which was produced by the legendary British producer Joe Meek. By 1964 with the onslaught of Beatlemania and the Merseybeat, solo singers were all struggling but Billy managed to keep the hits coming and by the end of the 60’s only Elvis, The Beatles and Cliff Richard could claim more UK hits than Billy Fury, but the time they were a changing and the hits started to dry up as Fury was starting to sound as old as his records. Lots of personal problems existed at this point but in 1973 Billy was offered a cameo role in the classic British rock n roll film ‘ That’ll Be The Day ‘ starring David Essex and Ringo Starr. Fury played Stormy Tempest a rock singer leading the Butlin’s style holiday camp band in the late 50’s which included Keith Moon and Dave Edmunds. Well worth seeing if you haven’t. With his voice and good looks still intact, Billy steals one particular scene by cradling the microphone in one hand close to his mouth while the other hand steadies the mike stand across his thigh all the time looking and performing to the pretty girls in the audience one by one. Ronco released an LP for the soundtrack and also a 5 track EP of the songs Billy performs in the film and this EP has become very collectable. Rumour has it that during the filming the entire film crew was banned from every hotel on the Isle of Wight because of Ringo’s and Keith Moon’s high booze intake and the resulting mayhem that followed with everyone involved after the days hard shoot. In 1981 while I was working for Polydor Records in London I was lucky enough to have the opportunity to sign Billy Fury to a new recording contract and reach the lower reaches of the UK chart with the 45’s ‘Devil or Angel ‘ and ‘ Love or Money ‘ and we was recording an album with producer Stuart Coleman ( Shakin’ Stevens) and a great studio band which featured Terry Williams (Rockpile and Dire Straits) on drums, Pete Wingfield on keyboards, Billy Bremner (Rockpile) on guitar, and Mick Green (Johnny Kidd & The Pirates) on guitar. The album was only released after Billy’s untimely death at the age of 42 in 1983. Two things I personally remember about Billy is one time being in the studio with him to record a vocal track and we had to turn down the lights in the studio very low because of his shyness but when he started singing out came this perfect voice which even after twenty years he had not lost! and also a Buddy Holly night at the Lyceum Ballroom in London which was put on by Paul McCartney which I attended with Billy’s manager Tony Read. 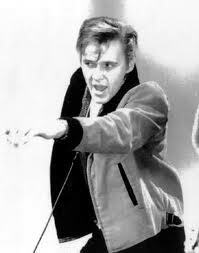 When Billy Fury was introduced to the crowd he nearly brought the house down with his many fans that were there that evening. Fury also showed great respect to his excited fans by taking the time to talk to them and to sign every last autograph for then. A true star! 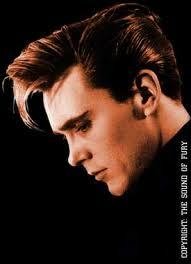 I got really close to Billy Fury in his last years of his life and we became good friends. I remember him as a shy guy almost unsure of himself and his talent. A singer who had been totally ripped off and mismanaged in his career, but his time spent on his farm in Wales in his later years was where he was most contented, there he bred horses and spent a great deal of time bird watching of the feathered kind ~ two of the great loves of his life, far removed from the Fury and bright lights of the music business. I still miss him ~ like many others. If you visit Liverpool then don’t forget to see the beautiful bronze statue of Billy in the city. This entry was posted on Friday, November 4th, 2011 at 2:23 pm and is filed under 45 rpm Singles, Billy Fury, British 60's LP's, British Film, British Rock, Halfway to Paradise, Ipods and Record Players, Johnny Kidd & the Pirates, Shadows ~ British Instrumentals, The Beatmerchant Specialty Record Store. You can follow any responses to this entry through the RSS 2.0 feed. You can leave a response, or trackback from your own site.